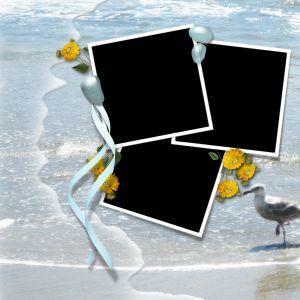 Click to print this free beach layout. Scrapbooking is a crafty and fun hobby, but requires a lot of supplies - whether you scrapbook traditionally or digitally. Use free supplies from LoveToKnow and have papers, stickers, clip art, and more at your fingertips for only the cost of printing. Print any of the scrapbooking papers or supplies by using Adobe Reader. After downloading and installing, simply click on the item you wish to download and select "Open with Adobe Reader" when a pop-up box opens. Several of the printable paper collections and individual papers come in different sizes: 12x12, 8x8, and 8.5x11. Papers with various size options will have them listed in the caption. Select the size by clicking on the right caption for the collection you wish to print on those that have both. Once you open the collection, you'll have the option to view and print the individual pages you want to use. These basic paper collections make excellent backgrounds, frames, and shaped designs. Enhance any page design by using these individual papers in plaids, damask, flower, and text designs. Digital scrapbooking has recently taken off. Use these great patterns to create a page right on your computer before printing at home or sending to a printer. To download the papers you desire, open the collection, select the paper you wish to download by its name in the left column, and save the attachment. These bright patterns are coordinated by color so you can created a cohesive scrapbook. Pick out a set of Christmas patterns to make a special holiday book or page. Use shape outlines to cut out shaped pictures or as templates for patterned papers. Print off filled shapes and add them to your page without needing to cut into any of your patterned papers. Predesigned layouts make putting together a scrapbook quick and easy. Simply add photos or text to the designated areas, and a few embellishments if desired, and you have a completed page. Whether you spent a day or a week at the beach, you'll want to commemorate it with a special page full of memories. Celebrate Dad with a page made just for him. Graduation is a special time in any young adult's life. Use these pages to celebrate the success of your child. Wedding festivities deserve a special place in any scrapbook, whether they are your own or you were part of someone else's big day. Sometimes you just need a quick layout that doesn't necessarily fit with a particular theme. Use these pages, from swimming to teddy bears to awards, to celebrate any special moment in your life. Print scrapbook stickers on adhesive paper, cut, and stick to your scrapbook page. Stickers are a quick way to add a little extra embellishment to any page without needing any special crafting skills. Clip art enhances a plain or simple page without requiring special stickers or adhesive printing paper. All you have to do is print and cut these themed images to use them. Frames are a good way to highlight a particularly good photograph, important memento, or text block. Choose a shaped frame to fit a theme, or a basic frame for any page. Add a themed element to plain colored paper by adding a border. Borders can be at the top, bottom, or side of a page; they can also be used to draw attention to special photographs. Spooky and festive Halloween borders can take a plain gray, orange, yellow, or black paper and turn it into a special holiday page. Adding a pre-written poem to a scrapbook page is a great way to include text without writing your own text or poem. Print a poem off on colored paper so it matches the page's color scheme.